It seems like a lifetime ago when some black people were asking if Barack Obama was "black enough" and some white people were insisting that he was "not really black." Those silly debates seem quaint in retrospect. Back then, people were merely having trouble wrapping their minds around Sen. Obama's biracial heritage and itinerant upbringing, because it didn't mirror the stereotype some consider to be "authentically black." Indeed, a white writer at The New York Times opined that Sen. Obama was "not black in the usual way, " while a black columnist at the New York Daily news argued that the senator had not "lived the life of a black American." Of course those views are irrelevant now that Sen. Obama has been officially outed as a black man and the gulf of racial misunderstanding magnified. No one is questioning his blackness anymore. Despite the fact that he always self-identified as a black man, it took the intemperate and racially-charged remarks of Sen. Obama's former minister to force many white people to accept that he was indeed black – not black-lite, not sort of white, and not culturally or emotionally white. Polls show that conservatives and Republicans who were drawn to the Obama campaign have already begun pulling back their support. This should not surprise anyone. Who knows what independents will do in November? The "Race Doesn't Matter" mantra that was a potent symbolic imprimatur of Obama campaign rallies would undoubtedly seem incongruous now. Most black people have always known that race does matter. As proof, we have only to look at the disparate reactions of whites and blacks to Rev. Jeremiah Wright's comments. Whites criticized Sen. Obama for being aligned with an unapologetic "race man." Blacks defended him for it. I can't help but wonder what the senator, who has consciously run as candidate not defined by race, must be thinking now that he has been, well, defined by race. As moving as his speech in Philadelphia was, it was still a speech given under duress as the controversy threatened to overtake his campaign. I was as saddened by it as I was inspired, and I suspect the black people in the audience who cried may have felt the same way. Perhaps they were thinking what I was thinking; that even this most "non-threatening" of black men, this "palatable" and "safe" black candidate, this man ostensibly unencumbered by the racial baggage of former candidates like Jesse Jackson and others shaped by the civil rights struggles of the past, could be transformed overnight from a symbol of racial reconciliation to a sympathizer of racial separatists. Those who believed Sen. Obama would be given the benefit of doubt on racial matters forgot that the margin for error for a black candidate is very narrow and often unforgiving. Sen. Obama's speech has been compared to other landmark speeches on race, specifically the Rev. Martin Luther King's "I Have a Dream Speech." The comparison is a stretch. In addition, King dealt with race daily and unambiguously in a way that Sen. Obama never had to. King's leadership was based on forcing America to face its racial problems on a regular basis, while Obama's campaign was premised on transcending race. King hoped for the day that character would trump race; Obama operated on the belief that that day had arrived. He tacitly demanded that his candidacy be judge by the content of his character and not the color of his skin, as King said in that famous speech. 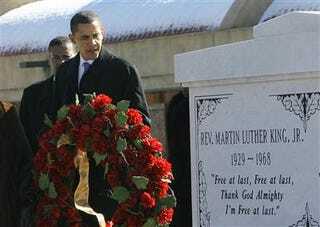 Yet even 40 years after King's death, the lingering significance of race today ultimately forced Sen. Obama to address the subject head on and reminded us that "transcending race" is a still a flawed and impossible notion in modern American politics. Sen. Obama has come a long way from another famous speech that catapulted him onto the national stage and indirectly launched his presidential bid. That speech, delivered at the 2004 Democratic National Convention in Boston, immediately bestowed him with legitimacy and white acceptance. "There's not a black America and white America …there's the United States of America," he said back then to thunderous applause. When I heard him utter that line, I remember thinking: Oh yes, there are two Americas. That line rankled black people who knew better and caused some initial suspicions of the then little-known Illinois state senator. After all, they wondered, what black man living in America could actually believe that there is truly one America? Black people spend much of their lives negotiating the border between the two Americas in the workplace and at home, in public places and private spaces, in voluntary relationships and involuntary interactions, in our neighborhoods and schools, and, yes, in places of worship. Some of us have managed to find balance between these two worlds, to live integrated and mostly harmonious lives in the middle. Huge swaths of Americans, black and white, have not. They are stuck on opposite sides of that much talked about, clichéd, racial divide and that's where they will remain, either by choice or by circumstance. They will never get to know each other, find each other's commonalities, or see each other's humanity. Sen. Obama has a more optimistic outlook. In his 2004 speech, he said: "For alongside our famous individualism, there's another ingredient in the American saga, a belief that we are all connected as one people." I wondered then, and now, if most Americans really believe this. "We are one people, all of us pledging allegiance to the stars and stripes, all of us defending the United States of America," he said at another point in the speech. Seeing ourselves as "one people" is indeed a worthy ideal that many of us allow ourselves to dream about in un-cynical and hopeful moments. But we are not there yet. That Sen. Obama's candidacy was being so fully embraced by Americans of all racial stripes gave us reason to believe that we were moving closer to that goal. But the swift and unrelenting condemnation he received over the minister's comments made my head spin. It was a reminder that white political support for black candidates often comes with strings attached, and that those strings are tenuous when it comes to racial matters. Rev. Wright's comments made some people, black and white, very uncomfortable and those people had a right to question if Sen. Obama's shared his former minister's views. His Philadelphia speech should have put those questions to rest, especially because his political record and his life story seem to so strongly argue the opposite. As much as I hated when black people asked if Sen. Obama was "black enough," I'm equally disheartened that white people may now be wondering if he is too black. I just hope that his now two famous speeches don't become bookends of political career sidetracked by the issue of race. I hope, instead, that Americans use them as guideposts on our journey to becoming One People.